So I’m a couple days late on my next review. But this one was well worth the wait! This bar lacks the deep smooth brown of other dark chocolate, however being a %55 cocoa it seems right on par . The repeated stamped “CHOCOLATE” was perhaps lacking in originality but added a fun eclectic touch anyway. Scoring lines are almost always a welcome touch as they helped lend a hand in moderation… something that was rather difficult with this selection. When it comes to texture, this bar was a knock out. I’m not usually a big fan of coconut in, well anything. However in the case of this bar it added a complex heterogeneity of texture not found in other bars. I couldn’t put it down, seriously! Stevia, an unusual choice for sweetener, and something I’m not a fan of in general. Here though, it was a winner! 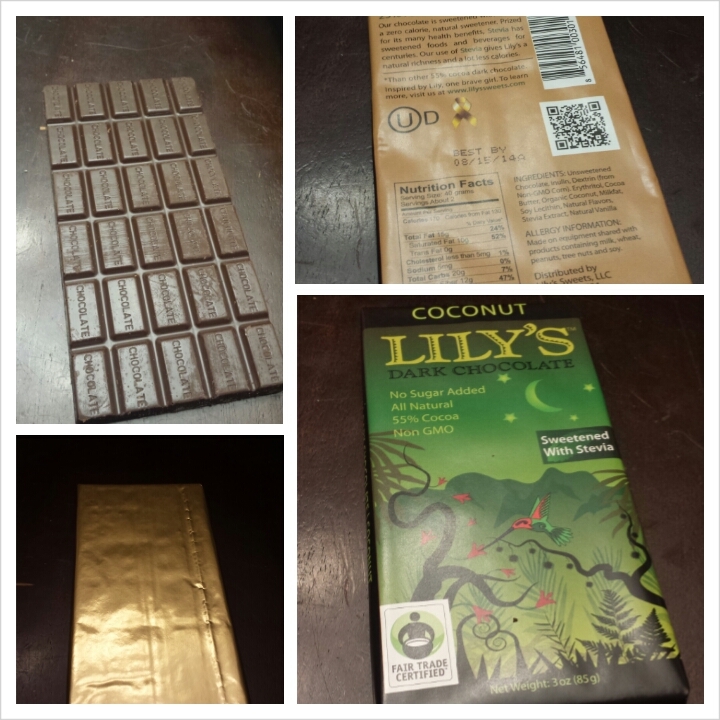 The bar was silky sweet with out over doing it, and the coconut was significant contribution to the taste but manages not to overpower the all important chocolate. Summary: A surprisingly good bar with unexpected flair.